On April 9, 2012; almost a year ago, the Ghana Football Association made a huge announcement. The Black Stars head coach role had been vacant since the sacking of Serbian trainer Goran Stevanovic – and the FA had been hunting for his successor. Assistant James Kwesi Appiah was the chosen one. He was to be Ghana’s first local coach in almost a decade. “I know there will be immense pressure and I expect that. I have been around the team for sometime now and I am very much aware of the challenges and pressures that comes with the job.” Appiah said after his appointment. There was an aurora of optimism around his advent. Ghana was in the wake of – per the nation’s high standards – a ‘disastrous’ Africa Nations up campaign in 2012, and the unanimous media and public consensus alike emanating from the tournament post mortem was that, the team needed to move on, minus it’s gaffer. Appiah was tasked with the objectives of winning the 2013 Africa Cup of Nations(even though the side was in transition and under construction) and qualifying the country for it’s third successive World Cup, after a fairy tale debut at Germany 2006. Being, in his own word, ” a man of few words”, Appiah got to work in earnest. His debut game was magical – the stuff that a coach’s dreams are made of. A devastating Ghana side, featuring new sensation Christian Atsu of Porto, walloped Lesotho by seven goals to nil in Ghana’s first World Cup 2014 qualifying match in Kumasi. A statement of intent. Kwesi Appiah had truly arrived. His next game was a reality check. Ghana had traveled to play Zambia in their brand new stadium in Ndola, and lost by a goal to nil. The set back however proved temporary, as Ghana went on to remain unbeaten in six matches before the afcon. In South Africa, Kwesi Appiah propelled as many as ten debutants into Ghana’s squad and later became a victim of a pervasive culture of subjective and unrealistic expectations. A culture that has become entrenched in the mentality of the average Ghanaian football fan. 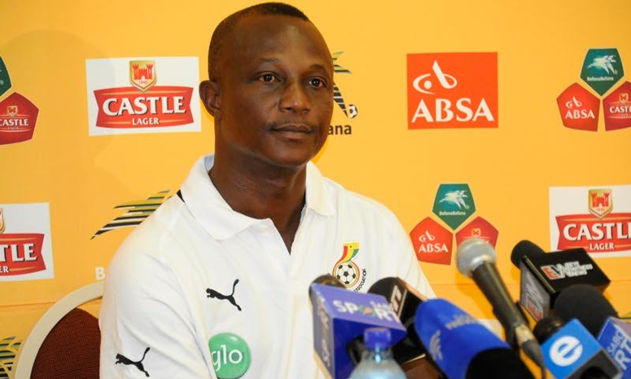 The belief that to win the trophy is more or less Ghana’s divine right meant that Kwesi Appiah wasn’t spared merciless villification after a tournament at which he placed fourth – losing only once from open play. To be fair, a whole wave of criticism – unfortunately polluted by some basically destructive ones – had always been on stand by. People actually expected him to fail. Others wanted him to. “After the game against Cape Verde, which we won 2-0, people were asking me: ‘Are you going to resign?’ You know, you really don’t need that after a game you’ve actually just won.” Appiah complained during the tournament. This meant positives like scoring 10 goals in six matches and the discovery of new talents (exceptional goalkeeper Fatau Dauda and goal hero Mubarak Wakaso et al) were overlooked – with the prime negative of failure to win the trophy being focused on. Ghana had lost a grueling semi final clash with neighbours Burkina Faso on penalties, after cruising through the group stages and quarter final with three consecutive clean sheets and without losing a game. But Ghanaians expressed concerns over the what they thought was the team’s overall ‘unimpressive nature.’ Calls for his head began emerging even before himself and his squad touched down in Ghana from South Africa. And so it was settled. Kwesi Appiah would stay on to lead Ghana in the battle to qualify for Brazil 2014 – a tournament, mind you, he’s been tasked to make the semi final of. A tournament he has not even qualified for yet. A tournament, given Zambia’s current advantage in Ghana’s group (after being awarded three points and three goals as a consequence of Sudan fielding an unqualified player against them) he may never qualify for. This raised the stakes even more. Kwesi Appiah began feeling the heat. Only weeks ago, top Ghanaian Sports journalist Christopher Opoku revealed exclusively in a column that the GFA, owing to the President’s strong message of qualification being a “must”, were beginning to doubt if Appiah was the man for the job after all. Rumours of him being given the sack after the Sudan game gathered momentum. “It’s not looking good for Appiah” an inside source told Opoku. And all this was happening at a time when brothers Andre and Jordan Ayew – both sons of legendary Abedi Pele and both dropped by Appiah for the tournament in South Africa, had handed in temporary resignation letters. This is the thing: one of the anti-Appiah activists’ biggest criticism was his dropping of these brothers, and so their decision to quit was seen as a consequence of Appiah’s ‘incompetence in man management’. It remains to be seen. Kwesi Appiah is in a fight to save his job. And given strong rumours that an expatriate is in line to replace him, he’s the representative of local coaches in a tug of war which can only be won by conquering Sudan. And if indeed the Sudan game would be his last, Appiah would’t want to be pusillanimous. He would want to bow out – to borrow Sid Lowe’s analogy used for Mourinho’s imminent exit from Real Madrid – por la puerta grande (out the main door, triumphantly).